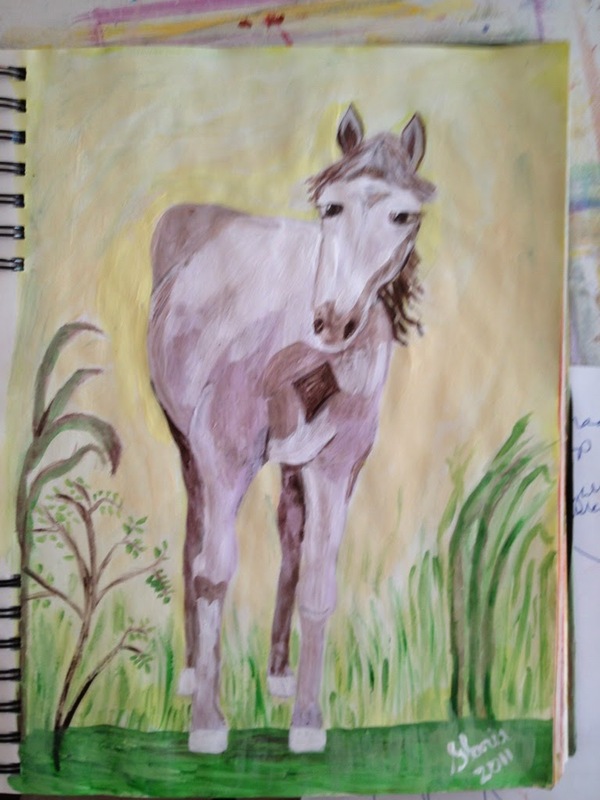 I, Gloria Poole, of Missouri and Georgia, am putting here a second batch of horses I drew and painted and signed as sketches on paper. This is to keep a promise I made on another blog of mine at https://gloriapoole.blogspot.com. I will label each sketch underneath the image so you can read about it. Also, see my copyright notice below all ten sketches. 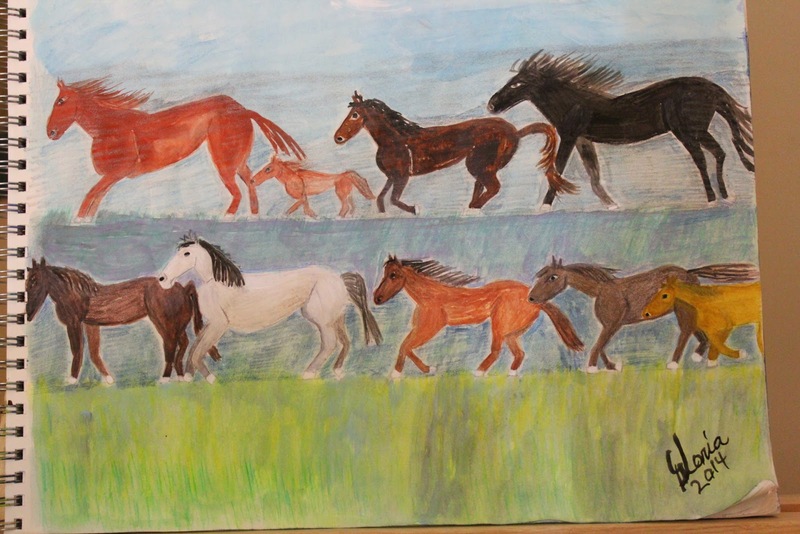 None of the people in these sketches are real people but made up by me with a pencil [as were the horses] and with paint. Also, I drew another sketch yesterday and it in progress. 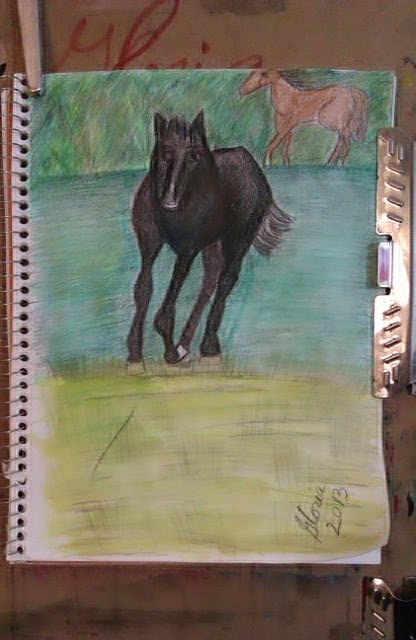 it is in pencil so far and thinking on how I want to draw the background of it. I will probably post it to a blog of mine later, when I complete it, fyi. 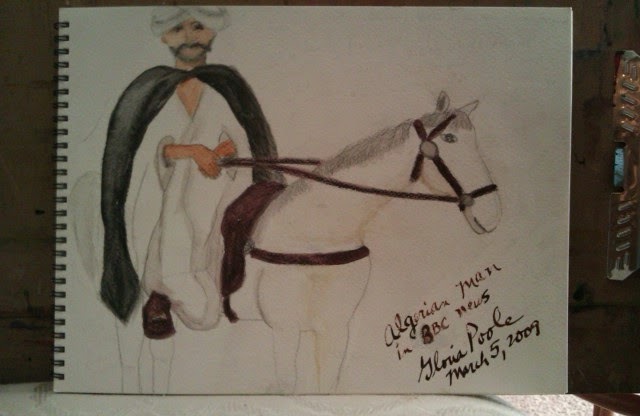 "Algerian Man" on horseback sketch by Gloria Poole; yr 2009 when I lived In Colorado. I moved from Colorado Oct 31, 2009 to Missouri. See about me pg and copyright notice for more info. 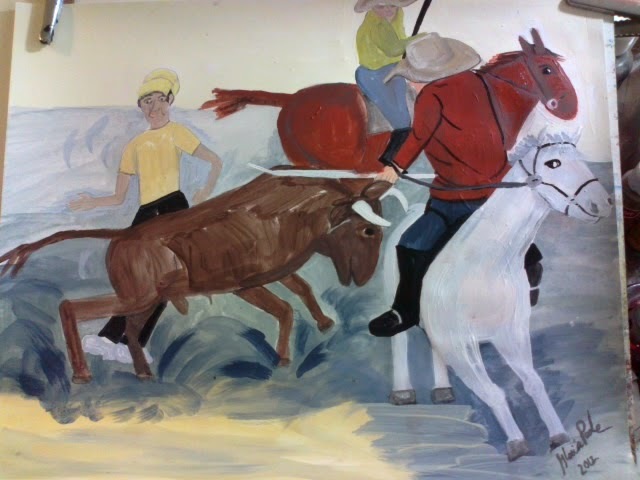 Copyright Notice: I, Gloria Poole, residing in Missouri but born in state of Georgia, own this blog and all rights to it. 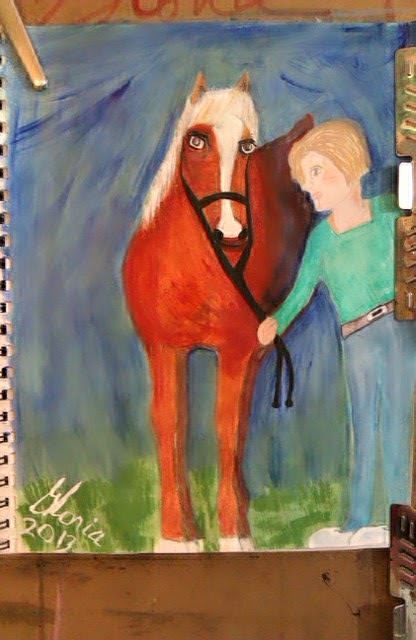 I created it to begin with, years ago [but modified last year] , and have continued it after I moved to Missouri Oct 31, 2009. I own all rights to this blog and to all content of it. 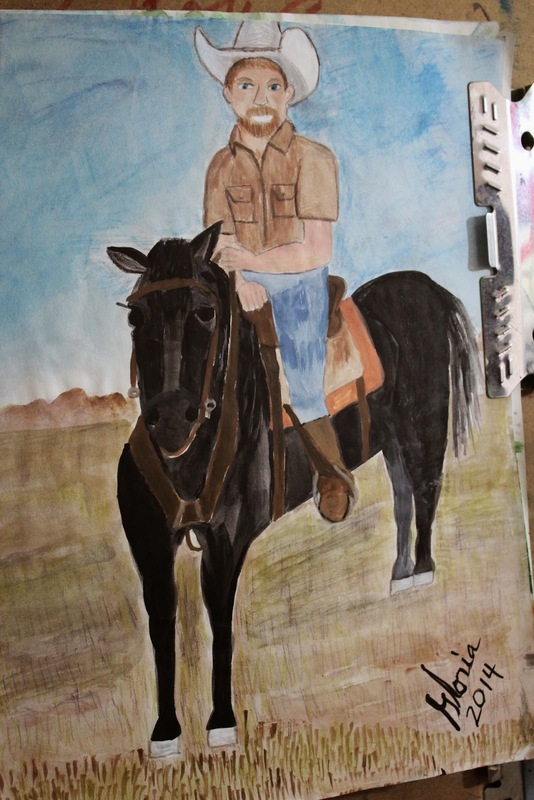 I drew, painted, signed it, photographed it; and uploaded it to this blog. 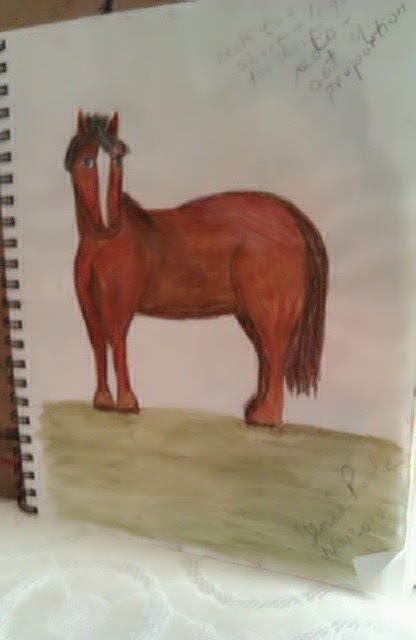 I have the original paintings and sketches. I also own all rights to any art, words, graphics I have created or do create in any place, for any reason or no reason, with any tool or method or brush on any surface, at any time. I have never assigned my copyrights to any one and I do not have an artist's rep or a literary agent at this time and have never had either [in the past]. 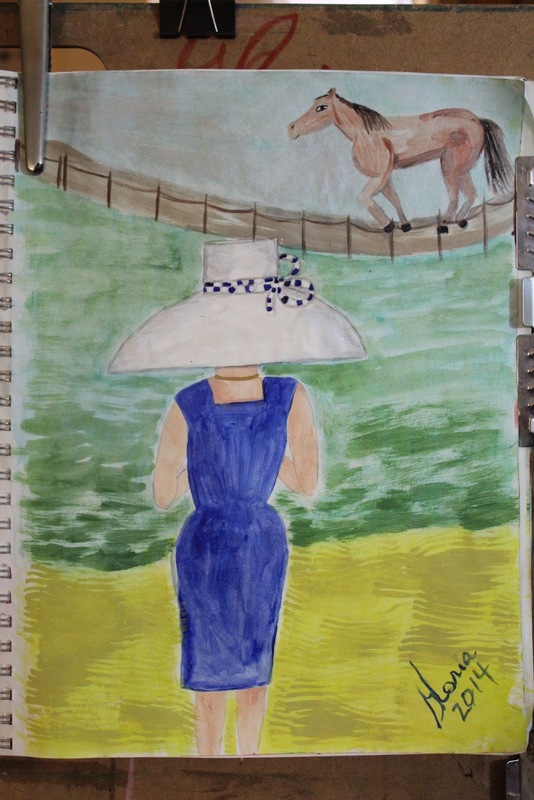 I sign my name on art as Gloria, and on some sketches as Gloria Poole. Gloria Poole is my real, born with, legal name since I resumed it legally after my 2nd divorce which was in Arapahoe County Colorado. I removed the Pappas name from my name forevermore by order of District Court Judge at time of final decree of divorce from male DBP in Oct 2007 who lives in Colorado; and I resumed my maiden name including my surname of Poole. I moved to Missouri on Oct 31, 2009. 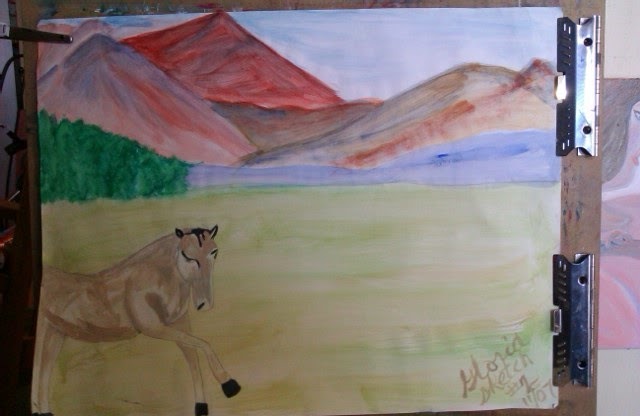 I am also known on the web as; gloriapoole; Gloria as on art such as this which I signed when I completed it; gloria.poole; gloria-poole; gloria0817; gpoole817; gloria_poole; gloriapoole1749; gloriapoole.RN; gloriapooleRN at yahoo in which the RN means standard abbreviation for Registered Nurse; and as artist-gloria; artist-gloriapoole; gloriapoole-paintings; Poole, Gloria; Ms. Gloria Poole; Gloria Poole creator of words that WORK and Tapestry of LIFE; and as other variations of my real, born with, legal name of Gloria Poole. And I am known as G-L-O-R-I-A on http://gloriapoole.wordpress.com and I had three domains with much art I created with my name written that way, for about 6 yrs until they were stolen from me by cyberthugs. I also had many domains and many with my very name written as gloriapoole in them from years 2004-2011 when criminals broke into my web-hosting accounts and ripped my domains and content right out-of-admin-panel. I have not bought domains since , because there is no security on web-hosting 'packages" because they do not honor business law or contract laws or any laws that I can tell since web-hosting companies do not try to stop cyber-criminals. Also important for law enforcement: Divorce from DBP was a second divorce for me and that horrible marriage only lasted four years, thank GOD. DBP of Colorado is not authorized on any account of mine and does not represent me in any way and NEVER did. Also, DBP has a restraining order against him and is not authorized in my apt or to log in to my computers or accounts of any sort. Gloria Poole; of Missouri and Georgia; at my apt in Missouri; 23- March 2014 at 10:14am.